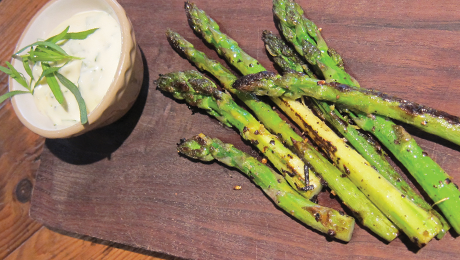 Serve the crispy warm asparagus, with the tarragon mayonnaise on the side. First, make your mayonnaise; place the egg yolk, mustard and a pinch of seasoning in a glass bowl. Using a balloon whisk, whisk the mixture while slowly adding the sunflower oil, little by little in a thin trickle. As the mayonnaise thickens, add the oil in a more steady steam whilst continuously whisking. The mayonnaise is ready when it is thick and glossy. Add the tarragon vinegar and fresh tarragon. Add more seasoning if required. Store in the refrigerator until you’re ready to serve it. Next, preheat the oven to 220˚C/425˚F/Gas Mark 7, then lay the asparagus spears on a baking tray. Brush them lightly with the olive oil, and season with salt and pepper. Place into your preheated oven and roast until the asparagus is nicely roasted and tender. Transfer the asparagus to a platter, toss with lemon juice and salt to taste, and serve.